Can you believe it is nearing the end of 2017?? The last few months have flown by and by now a lot of business owners are making their marketing strategy for 2018, have you got started? One big aspect of the marketing strategy will be social media, and how best to use it for your business. Over 2017 we have seen some changes within social media that have, or will shortly have, an impact on the way we use it for business. Here are some of the top changes of 2017. Yep, unfortunately it seems Social Media for business is starting to get costly. Whereas previously your reach would be high just by posting daily, now a lot of the platforms are reducing that reach unless your willing to purchase ads. Facebook is the biggest one to tighten the reach belt, and coming up before the end of 2017 its going to get event worse – Facebook admitted their new plans will reduce reach up to 60% for businesses. They recently introduced a new layout for news feed, 2 news feeds – 1 for business, 1 for personal. Business posts will no longer be shown in the every day newsfeed and individuals need to make the conscience decision to switch to the business newsfeed to see what is happening on the pages they follow. The only way to be seen in the normal feed is through advertising. YouTube has always been the favoured platform for video but now nearly every platform offers a live streaming facility, with many favouring it to the traditional text updates. The facilities have been there on various social media platforms previously, yet in 2017 the use of video marketing has sky rocketed – with use around 4 times higher than 2016. With live streaming posts and video stories, businesses have been able to get in front of a larger audience in way TV ads never could. Even LinkedIn has jumped on the video band wagon. Examples of successful videos are how-to videos for make up, resulting in the viewers wanting to know where they can buy. Mini coaching sessions, followed up with the offer of more in depth coaching if individuals pay for the service. The building of communities around services and products thanks to the use of mini videos dropping tips and just video journaling their business journey. Facebook are now introducing Collaborative Stories for Group and Event Pages. This update allows multiple group members and event attendees to contribute their own view/opinion on a story. The admins will be able to moderate this, manage privacy settings and encourage others to join in. Apps such as WhatsApp are popular messaging apps for personal use. However it was recently announced by WhatsApp that they will also now be used for businesses to communicate with their customers. Whether it is as a marketing tool or a customer service tool. Facebook messenger has previously been a popular messaging app to communicate with customers through business pages. But the new plans will be to allow businesses to communicate with the customers and inform them of up coming bookings, travel times etc. Previously web developers have been able to add a click to call button on websites, using either Skype, or a phone’s dialling screen to make the call, coming soon there will also be the chance to add a click to chat link via Whatsapp. This is something I have had experience of this year, and was an interesting learning curve. Social media platforms are adding their own shopping platform. Facebook took the initiative and have introduced a shop element to business pages, where sellers can add their items in a catalogue format. Buyers can then either buy on Facebook or are sent through to the seller’s website to complete the purchase. From uploading the products, organising the catalogue to marketing products and managing orders, Facebook allows it all. However, Twitter has removed their buy it now button and replaced with additional features to encourage more website conversions than previously. Pinterest however are embracing this new element. They are now allowing Pinners to search for ideas – for example an night out outfit using their Lens Your Look tool. Upload an image of something in your wardrobe and Pinterest will find matching items to finish the outfit off. For the upcoming season, you can connect with Friends and Family and Pinterest’s API will create a gift board based on what they have been engaging with during the year. Not something new but something that is definitely growing, with more and more businesses finding a use for them. Whether it is just sharing a little bit of information to individuals visiting your social media accounts, or as a 24/7 customer service option. Just interacting with a post on social media can now activate a chatbot to send a message with more information, and ways to get in touch. I have seen this in use with a lot of start up businesses and small businesses, as it is becoming more popular and easier to implement than ever before. To learn more about Bots visit Business Insider UK who have done an excellent article on them. 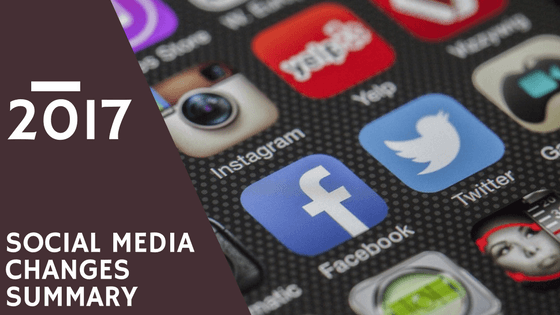 These are just a few of the updates Social Media has seen, and there are plenty more that I am sure you have experienced. This is why it is important to keep updating your strategy every quarter to avoid using out of date practises and your business suffering.